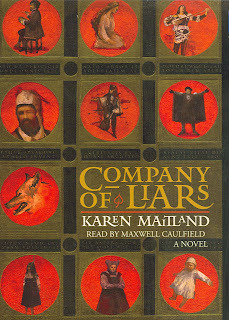 Although it is billed as "a retelling of The Canterbury Tales", Karen Maitland's Company of Liars shares only a few similarities with that famous work. Both works take place in the 14th century and concern a band of travellers, but they are distinct stories. Camelot -- the narrator of the story, who makes a living selling "religious relics"
Each member of the group tells stories to entertain the others, or sometimes just to explain how they came to be where they are. The characters all have something to hide, and eventually, like in a good Agatha Christie novel, they begin to be killed off one by one. It is also wintertime, so in addition to the plague, the characters must struggle with difficult travel conditions, bad weather, lack of food, and the vexing problem of where to bury the bodies of their dead companions (since they don't want to arouse any questions from the authorities about how the unfortunates met their deaths). There were several surprising "twists" at the end of the story, which made the book all the more enjoyable. The author also includes a section of historical notes, explaining the various plagues that ravaged England at the time and the superstitious efforts of the people to ward off the sickness. There is also a glossary at the very end to explain terms used throughout the book.